A simple and convenient way to provide ample storage in unused ceiling space, the HyLoft Adjustable Height Ceiling Storage Unit is perfect for a basement, attic, garage, closet or office. Durably made of steel that is powder-coated for scratch resistance and durability, this unit adjusts to accommodate any ceiling joist configuration and has downrods that adjust in height from 30-inch to 40-inch Compatible with any HyLoft accessory, this unit is sturdy and strong and holds up to 300 lbs. of evenly distributed weight. KEEPER<sup></sup> 8' x 2" Cam Buckle Tie-Downs are specially designed for quick on/quick off. Fabricated from KEEPER<sup></sup> Hi-Test<sup></sup> webbing, these tie-downs are abrasion resistant and remain durable even after repeated usage. With 2" wide mouth cam buckles, 800 lbs. working load limit and 2,400 lbs. break strength, these tie-downs are perfect for use with a range of different vehicles, medium size tractors. Tough cam buckles grip the webbing without prematurely damaging the tie-down, and a quick-release thumb button makes them easy to use. Full-size vinyl-coated S-hooks with latch attach securely, ensuring outstanding performance when transporting your equipment. 2 pack. 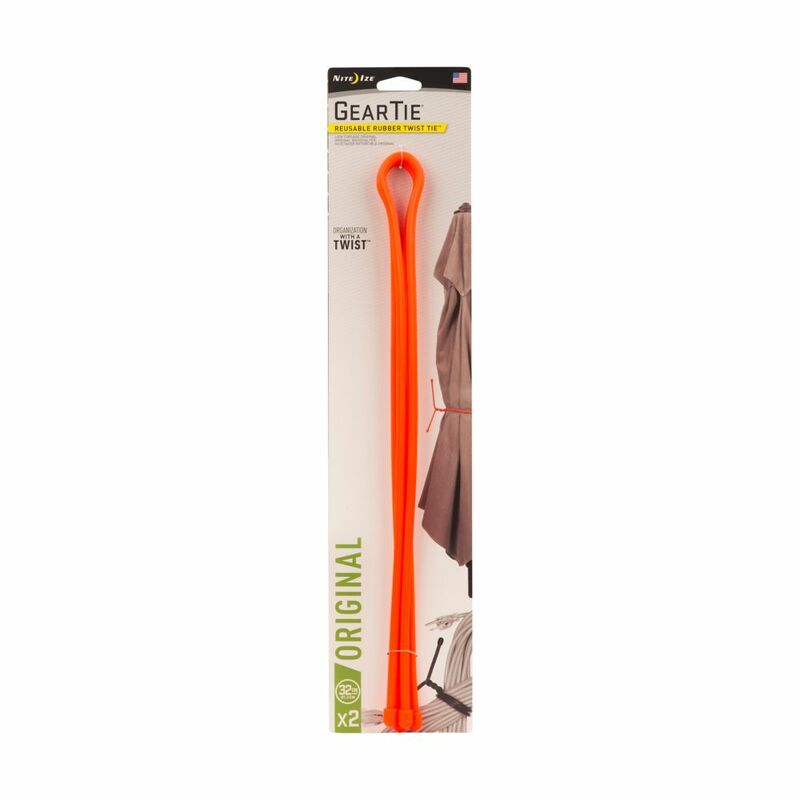 Gear Tie 32 Inch. 2-Pack Bright Orange The perfect size for bigger organizational jobs in your home, garage, yard, and tool shed, the Nite Ize 32" Gear Tie bundles garden tools, hoses, and industrial appliance cords in a cinch and a twist. Its flexibility (it has a sturdy, bendable interior wire and a durable, waterproof rubber exterior) makes it endlessly versatile and useful. Take it along on camping/fishing/hiking trips - perfect for wrapping sleeping bags, or, wrap one end around a hook or branch, and the other around your waders, and hang them upside down to dry on the spot. Great for securing uneven bundles of nearly every size. Available in packs of two. Gear Tie 32 Inch. 2-Pack Bright Orange is rated 5.0 out of 5 by 13. Rated 5 out of 5 by Noname from I bought this to wrap around a 100 ft electric... I bought this to wrap around a 100 ft electric cord to keep it in place. I just got it last week have used it, so far so good. Rated 5 out of 5 by BobS from Use these to hold small suitcase on rolling bag at airport. Also many uses on the boat. Use these to hold small suitcase on rolling bag at airport. Also many uses on the boat. Rated 5 out of 5 by fanbot01 from Finally a product to replace pieces of wire, rope and string for organizing storage and workplace... Finally a product to replace pieces of wire, rope and string for organizing storage and workplace. Best organizing tool to strap air hoses, extension cords and other items that need to be tied together to be more manageable in storage. The flexible tie with the bright colors make it easy to locate items. We also use this product to hold items in place with a single twist i.e. ladders and equipment stored inside of our truck. We recommend this product based on versatility, ease of use and pure genius in combing a flexible wire with bright plastic sheathing to organize not only storage but also the workplace. The product exceeds our expectations and we have no dislikes. Rated 5 out of 5 by Ian from I use to secure tool box and other stuff in my truck near the tailgate. It works great. I use to secure tool box and other stuff in my truck near the tailgate. It works great. Rated 5 out of 5 by Anonymous from These things are great. I have bought a bunch of... These things are great. I have bought a bunch of them. I use the. For extension cords, opened rolls of romex, I even used them to temporarily hold down a ladder rack that I bought for my truck bed. I love these things. Rated 5 out of 5 by rich3215 from Perfect for Attaching Shade Cloth Bought the GearTie Original 32 inch x 2 pack at Lowes and cut them into 2.5 inch lengths to attach shade cloth to the interior of my FarmTek 12 x 16 greenhouse. They fit perfectly into the rail slots (where the bolts usually go) and the ribbed outside and wire interior made them hold fast. I can pull on the shade cloth and they pop right out when I want to roll back the shade cloth. No more problems with wind, tears , sagging or using bolts to hold the cloth in place. Will buy more for their intended use too. Rated 5 out of 5 by HomeDepotCustomer from Can’t believe I’ve lived without these!!... Can’t believe I’ve lived without these!! Rated 5 out of 5 by M. from One of my favorite tools right now I work as a plumber for a school system. These are great for securing cords, hoses, cables, etc. We also use them as temporary pipe hangers, holding open stall doors, hanging work lights, seems like something new at least once a week.